I'm a former radio dj and currently work as a mailman. I was inspired to write this book a few years ago when a few friends and I were telling old stories. I thought about the long road I had taken to overcome alcohol, weight, and depression issues. I realized my journey could inspire others. I wanted to give a very honest account of what my journey was like so that others might be inspired to tackle some of the things in their lives that they wish to change. I struggled with a lot of issues and I struggled to overcome those issues. I know how hard it is but I also know it can be done. Layers of Motivation is an autobiographical, uplifting work of non-fiction by author Michael David Feeney. 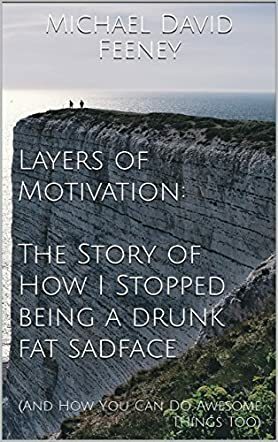 As described by the author, this is ‘The Story of How I Stopped Being a Drunk Fat Sadface (And How You Can Do Awesome Things Too)’. Focusing on the topic of personal unhappiness, Feeney presents an account of his life as it was in 2010 compared to now. Faced with an ultimatum to fix his life or start to lose the people he cared about, Feeney began a transformation from an alcoholic who was overweight and relying on convenience foods and easy sustenance. Nowadays he has lost over 100 pounds in weight, overcome depression and feelings of unhappiness, and has written this volume to help others to do the same. For those seeking an inspirational story, Michael David Feeney presents something that might be a little too brutally honest in places, but is always told with heart and the best of intentions. He hits on topics that most people get regularly upset about: being overweight or unappealing physically, having difficulties sustaining personal relationships and struggling with disillusionment at work, whilst at the same time acknowledging the crutches in life like alcohol and depressive thoughts by which we allow ourselves to be trapped. His tale of escape is not an easy one, but readers seeking motivation in their own lives may draw a lot of comfort from a man who says transformation is possible, and has proved it. It that’s you, then Layers of Motivation is a recommended read.